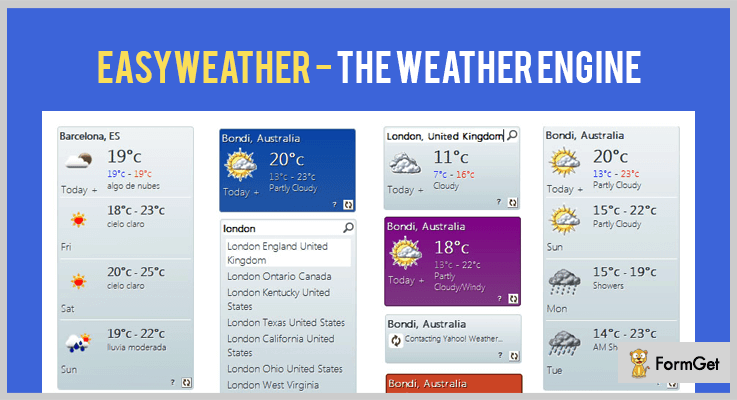 If you want to share weather updates on your website then you can integrate these jQuery Weather Plugins. Displaying weather forecasts on the website is an interactive way to increase the interaction and average session duration of the visitors. Restaurants, retreat centers, country clubs, and many other businesses can reap the benefits with this feature. Therefore, we are enlisting 5+ jQuery Weather Plugins that will let you add weather related functionalities onto your website. These plugins uses the API of weather information providers like OpenWeatherMap.org, worldweatheronline.com and there are inexplicable providers to write about. Your visitors will be able to check the weather information of any location as well as their current position from your website. These plugins also ensures that the weather information shared by them are correct. Let’s start with the listing! Through these plugins you can add videos to your website in multiple ways. These plugins will let you add interactive and responsive graphs on your website template. You can easily validate form of your website with these plugins. It is easy to use plugin that can provide weather and forecasts information on your website to the visitors. The plugin uses three weather API sources of weather information i.e. OpenWeatherMap.org, Wunderground.com or Yahoo Weather. It does so without changing the front end code of your website. It is fantastic for dashboards and sidebars of your website template. The plugin is made with flat UI CSS stylesheet for providing intelligible and cozy look for displaying weather info at you website. It also provides engrossing weather icons set to display high quality weather, maritime, and meteorological visuals. The code of this plugin is well-documented. You will get plethora of display options that will let you customize the widget for your website. The plugin is based on responsive CSS keeps it looking fine over desktop and mobile screens. It also includes example code for auto-refreshing on dashboards. Flat Weather jQuery Plugin charges $6 for accessing general features. If you’re looking for a versatile jQuery plugin that displays weather information for any location then you might want to give this plugin a try. The plugin offers many options making it completely relevant to match about any website design. Thus, you can use this plugin in portals, blogs and apps. Currently, the plugin works with 6 weather providers. However, it is designed to work with an unlimited number of weather API sources. EasyWeather implements a cascading fallback mechanism so that you can get back the old data even if a provider or the consumer is throttled by a service. The plugin supports multiple Geolocation services like geoPlugin, Freegeoip.net, Telize GeoIP and ipinfo.io. You can display up to 10 days weather forecast on your website. It also provides the functionality of custom location search bar. You can select units: Celsius/Fahrenheit and Kmph/Miles on your website. It has a regular license which costs only $10. Apart from it, $13 is the charge for extended 12 months support. It is a jQuery hypersonic-weather plugin that uses Yahoo Weather API for displaying the weather conditions. Through this plugin, You can display forecast, wind, atmospheric conditions, precipitation and sunset time. It supports the Geolocation to track the geographic location of a user and display the weather forecast at their current location. The included six color schemes and styles makes it easy to adapt to your current or future website design. It comes with different weather font icons having pleasing style, easy to add to your website. The plugin is compatible with IE10+, Chrome, Firefox, Safari and Opera. It supports °C and °F scales of temperature to display the temperature quantitatively on your website. You can also showcase animated preloader and fade-in effect for results to display when the rest of the webpage’s content is loading. $5 is the charge of its regular plan with 6 months support. For extended 12 months support, you have to pay only $6.13. The plugin used openweathermap.com API to present the user with a personalized weather forecast. It allows to display forecasts with the flat or openweathermap.com icon style on your website. You can provide 1-16 day weather report for the entered location by the user. It provides Fahrenheit or Celsius metric options. You can set the border radius of the weather forecast box as well as set it both horizontally and vertically. The plugin provides unlimited color options for styling. You can buy this plugin at $7. It is free weather jQuery plugin provided by GitHub. The plugin uses worldweatheronline.com API to get, parse and deliver data in order to create weather’s widgets for your website. The plugin uses mustache.js allowing you to change the template of your widgets according to your website”s layout. You can use this plugin to deliver weather’s data as well as to develop a weather widget. The plugin also uses the HTML Geolocation API to locate a user’s position. You can display weather data from cities all over the world on your website. It also has a client-server caching system by using Web Storage API and text file for the server side. It allows your website to store data locally within the browser. This jQuery weather plugin is free of cost. It is a weather widget plugin that can display the current weather of the user based on his browser’s geolocation. Thus it can be used to display the weather conditions of multiple cities/countries in the world. The plugin also provides a set of different icons and background image like snowy, mountains and hot desert. It displays automatically these images depending upon the weather. You can toggle between Fahrenheit and Celsius depending on the format you want to showcase on your website. The plugin also has multiple location search options. This jQuery weather plugin does not charge any amount for the lifetime. Now you’ve read some of the best jQuery weather plugins through which you can display weather forecasting info on your website. Most of these jQuery plugins offer a customizable weather widget to showcase them on sidebar or footer of your website. 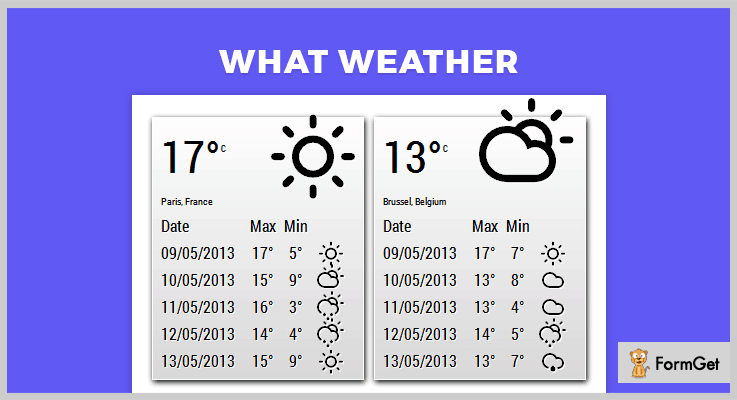 Do you have more recommendation for the jQuery weather plugins? Let us know in the comments!